Randy Choate started the eighth for Florida tonight: He walked Bobby Abreu on six pitches, then went to 2-1 on Alberto Callaspo. 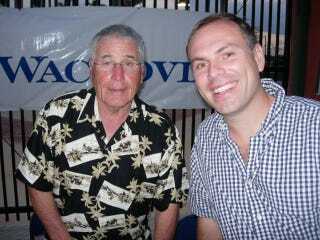 That's it, new 80-year-old sheriff in town Jack McKeon decided, and he pulled Choate for Burke Badenhop. Callaspo is a switch-hitter who prefers righties, so McKeon did, at first, have a reason for leaving lefty specialist Choate in, after he walked Abreu. But it's more fun to think of him nodding off while intending to change pitchers. Because he's old. Look, now, though! The Marlins have a 4-0 lead over Anaheim in the bottom of the eighth, as of press time, despite allowing 12 hits. Someone's closing in on a 2-19 June!